Please take these out for a test drive and let us know of any problems you encounter. -- Philip Chee <philip@aleytys.pc.my>, <philip.chee@gmail.com> http://flashblock.mozdev.org/ http://xsidebar.mozdev.org Guard us from the she-wolf and the wolf, and guard us from the thief, oh Night, and so be good for us to pass. Working very well for me so far. Looks like we're getting very close to to a release! Philip Chee wrote: Please take these out for a test drive and let us know of any problems you encounter. Address bar is locked (can't type there anything), some functions in menu don't work (e.g. add bookmark) and Add-On Manager is crippled (see: above picture). So I've made completely new and clean profile ("test2") using present version 2.33.1 and it works correct under 2.35 "pre-Beta". I think it's something with add-ons (maybe AdBlock Plus). I'll test it later. So... I managed with this "test" profile. It looks like one of extensions was outdated (I've mad this profile under 2.31 and looks like didn't touched it since then). 7) after all extensions were enabled and updated (including "old Venkman") profile "test" works correct with 2.35 (and 2.38a2). Later (or tomorrow) I'll test copy of my working profile (older and bigger than "test"). But you don't know which extension may have cause the issue initially? therube wrote: But you don't know which extension may have cause the issue initially? None, I'm afraid. Or all of them. 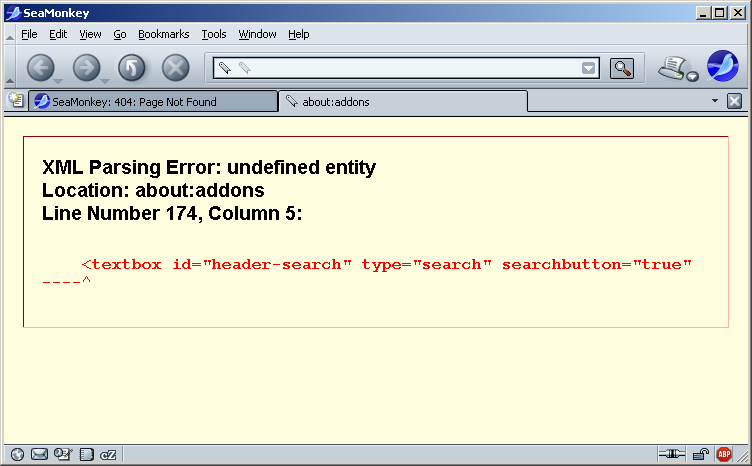 I've just tested copy of my working profile (with every extension up to date) and it's the same error. HA!!! There it is! It's about additional language pack for 2.33 ("English US" in my profile) when I enabled it this time (after enabling all extension one by one) then I've reproduced this bug. My profiles were made under Polish version. That's why "pre-Beta" gone crazy. When I removed (deleted) "langpack-en-US@seamonkey.mozilla.org.xpi" from "extensions" folder then SM 2.35 works correct. Installer (or SeaMonkey later) should disable such extensions IMHO.